Latest Listing at my Shop! NOTE: My patterns are free and I would like them to stay that way. You are free to print them out and pass them around but please make sure my blog address is somewhere on the pattern (www.knotyournanascrochet.com) so that people know where the pattern originated. Please do not sell my patterns or say they are your own. You are free to do whatever you want with the finished item. 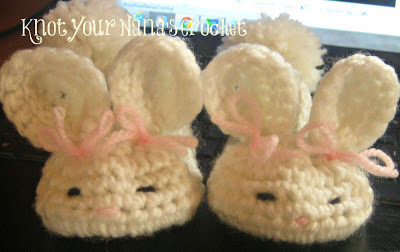 If you are selling them online please link back the pattern and give me credit. I took the time to write this pattern out so the least you can do is take the small amount of time it takes to give me credit. DO NOT JOIN, MARK EACH ROUND WITH A STITCH MARKER. Working in the round, mark first stitch with marker. Round 1: Ch 4, sc in 2nd chain from the hook, sc in next stitch. 3 sc in last stitch. Working along back of ch. Sc in next 2. 2 sc in last stitch. Round 3: sc in next 12. Do not join. I surface slip stitched a half circle in the middle of the ears but this is not necessary. Weave in ends, embroider face and sew ears and pom poms on. Add yarn bows and you’re finished.